The good news: my skirt pattern is back with me, my zippers have arrived (along with my seam binding, which isn't the right color, so that's bad news), and my blouse is almost done. The bad news? The blouse is making me crazy. The facings didn't seem to line up and I had to rip out a long seam I'd already trimmed and overcast to fix it; then it fit together perfectly but my wretched Rowenta iron puked rusty water all over the back. Luckily, the salt-and-vinegar method I tried got almost everything out, and a little cream of tartar seems to have finished off the last stubborn stain. It's drying now, and if it's all clear tomorrow I'll be finishing it off as soon as I pick out buttons. The further bad news -- removing the stain revealed just how transparent the fabric is if it gets the slightest bit wet. Looks like I'll be making a camisole while I'm at it. And cropped out of that shot? One very excited brand-new Daisy Scout. Who needs a blouse when you can make your little girl smile like crazy? The short-sleeved blouse: it's well underway! A tissue fit went well, a full muslin revealed that I needed a little more shaping in the waist (and to remove the shoulder pad allowance), the fabric is cut and it's proceeding nicely. I'm surprised at how little alteration I needed to do on it. I used the muslin to do a little experimenting with pattern marking and I've decided that I really hate the tracing wheel/transfer paper system. Back to tailor's tacks for me unless a better idea comes along. The cardigan: I've gone over the pattern and figured out what I need to do differently, as my fabric is a lot thicker than the fabrics the pattern calls for. I think I'll be lining to the edge instead of facing it, and that should work. I also need to pick out my buttons! I have some on my desk I think will be perfect but I should go through them all before deciding. The skirts I'm leaving until last because they are going to be so simple. 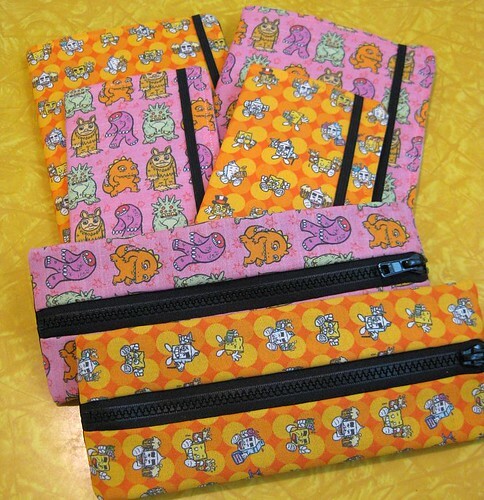 And because I haven't got my zippers (they should be waiting in the post office box right now). And because ....I went to tissue fit my simple-to-make skirt and only then did I discover the envelope contents of two sizes had been switched! And the size I needed (not my size either, but much closer) was in the envelope that I'd just donated to Pattern Rescue!! Luckily, it arrived there safely a few days ago and they graciously popped it right back in the mail to me. It should be here Monday. So, a few bumps in the road but I might actually pull this off by the deadline! 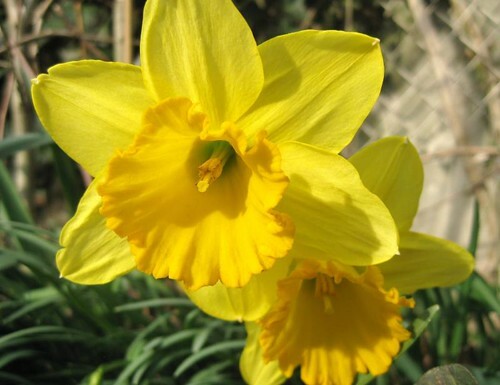 I hope it's lovely where you are, whether it's Spring or Fall! Spring is here, and it's time to get sewing! I've been needing to step up my sewing for myself this year, and I decided to take a stab at entering PR's "mini-wardrobe" contest. (Whatever happens, it seemed like a good chance to get a little motivation!) You have to sew four items that combine to make at least four outfits, and you have to do it in four weeks. I may have trouble with that last part, but...we'll see. An optional part of the contest is to make a design board showing your plan, and here is mine! 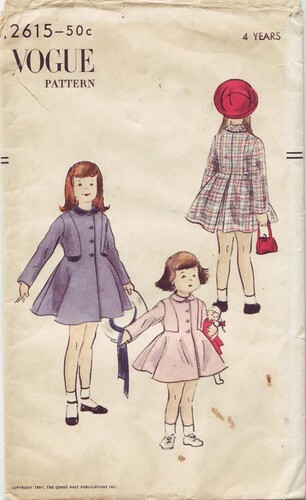 All the patterns are from 1953, and I'm actually making the clothes in colors and textures you could have bought that year. I didn't set out to have a gimmick, but I fell in love with that Butterick pattern and wanted to make the blouse and cardigan before I even knew about the contest. The skirts I picked turned out to be from the same year, and the fabrics were even appropriate, so I decided to go with it! I'm loving the fabrics -- the white is a rayon challis, very soft and comfortable; the cardigan is the new Polartec sweater knit fleece, just amazing in person; the plaid is a cotton seersucker, so summery and light; and the dark blue is a denim -- I had thought of going for linen but couldn't find the right color and didn't have time to shop online with swatches. The denim I have is very soft though, I think it'll work out really well. I hope so, anyway, I have it in black as well for a bonus copy of the skirt! Those pockets are going to be so useful, I think. I'll be modernizing a bit -- no shoulder pads, shorter skirts, and skipping the gloves -- so it's a totally wearable wardrobe I can work with. As a bonus, two tops (also vintage) I have to finish up when it gets warm will also go with the dark blue skirt; I'm not sure I have anything else that'll go with the plaid seersucker but I can work on that later. Like I said, I doubt I can get done in time to actually enter -- I haven't even begin to cut my fabric out, and the contest ends April 15th! I had hoped to be cracking on the skirts at least this past weekend, but life intervened. But I don't mind, I really need the clothes! And next, I'll be needing the accessories....that red belt at the very least! Gold! We didn't end up doing much for St Patrick's day this year, but Emily was more than satisfied to help me make rainbow cake. 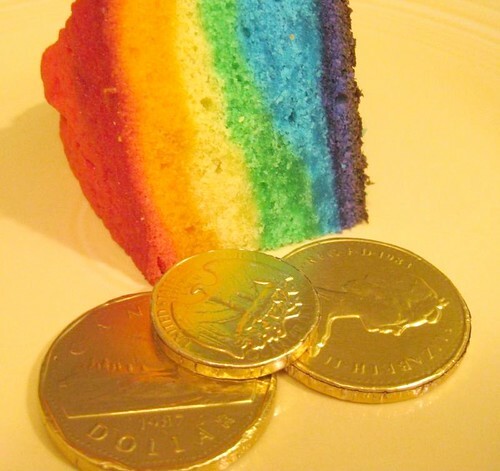 Then we surprised her by adding the "gold" when we had it for dessert. I love it when a plan comes together! So, I don't know if this means that Vogue actually owns the New York Pattern Co. library (my guess is no), or if they've just decided that NY patterns are fair game, but it's certainly interesting either way. If they think they're fair game, that's pretty good backup for the people who are independently reproducing vintage patterns -- and if they own them, maybe we'll see more of them! The idea of more pattern lines getting a shot at reproduction is pretty cool. I love vintage patterns, but cheap multisized repros certainly have their appeal, don't they? 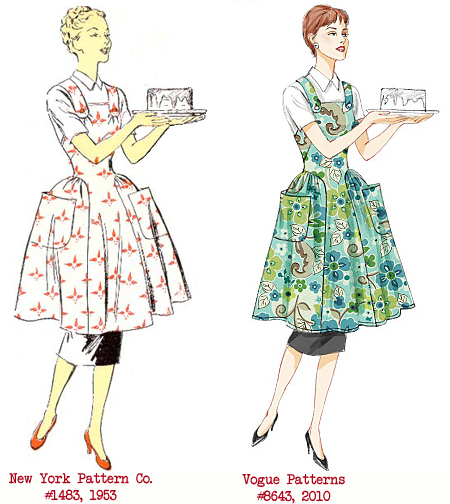 The other two views of this apron are also from the NY Pattern Co. original; I don't recognize the other pattern included in the reissue so I don't know who originally put it out. Vogue 2903 was originally S-4579 (the "s" tells you it's a "Special Design"). (Dated 1955 by CoPA, 1957 by Vogue). And 1043 was yet another Special Design, S-4382. I'd love to see all the reproductions matched up and compared to their originals! One thing that makes it difficult is the dating -- for example, CoPA and Vogue differ on a lot of those pattern dates. The Vogue 2903 reissue, for example, is dated 1957, but CoPA (who I trust more, to be honest) place the original in 1955. So you can't just look at the supposed original year. 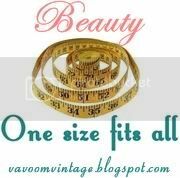 Speaking of comparisons, I found these really cool pattern posts on the Pins and Needles blog about a few different reissues: Simplicity 1734 vs 3673, Vogue S-4382 vs 1043, and Vogue S-4007 vs 2239. Really great info (and support for Vogue's assertion that they barely change patterns!). 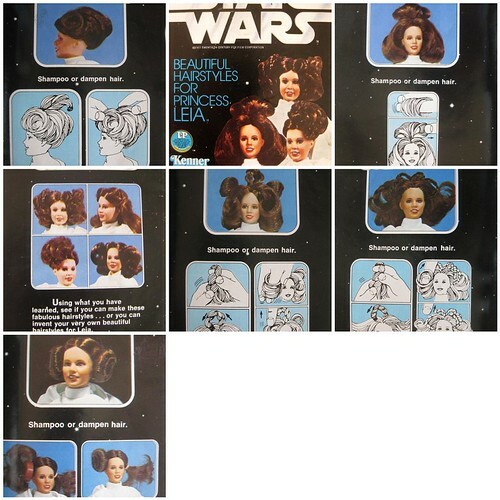 And not to ramble any more disjointedly than I already have, but I thought it was interesting to see that for all the things people say about vintage patterns and their "impossible" illustrations -- the modern one actually has the less realistic figure, I think! Her waist looks the same (although they narrowed the hip ruffles) but her neck, arms and legs look like they're about to snap. Anyway, I'll be keeping my eye out for more matchups! 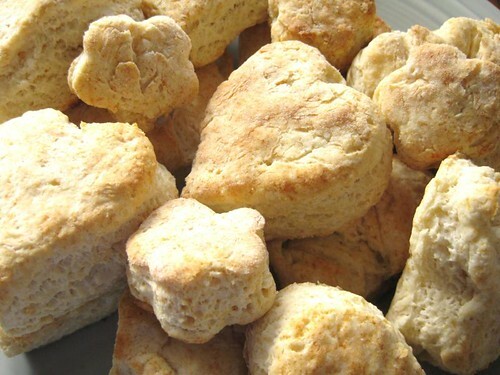 first, every Saturday is Biscuit Day. Emily is very firm on this point. second, as it turns out, heart shapes are far more efficient than the traditional circle when cutting out. And cute! Win-win! 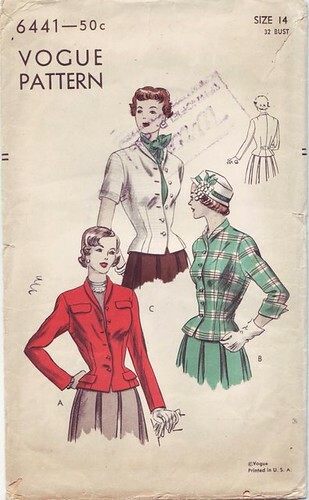 I submitted some patterns to the Vogue Patterns vintage search recently (the one above, plus a handful more), but I wasn't really sure what would happen to them (you don't submit the patterns, just scans or photocopies). 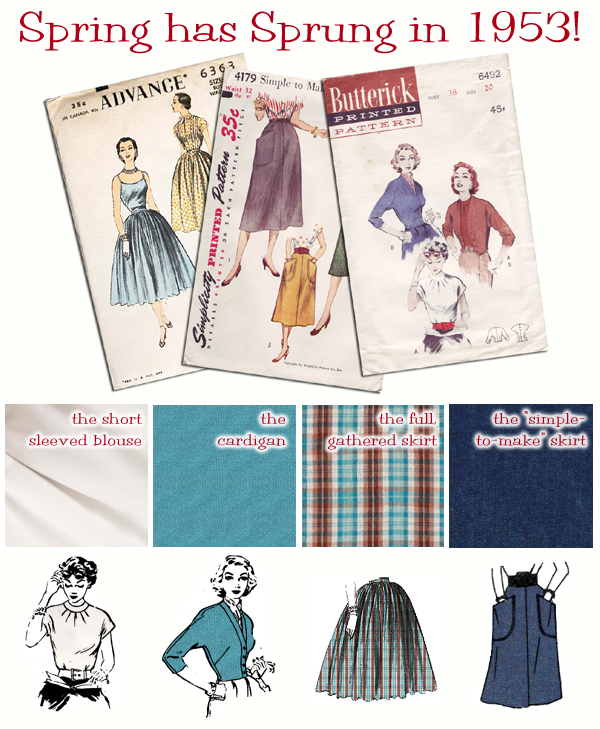 Luckily Pattern Junkie did more than just wonder, she actually wrote them to get the details! Check out the info she got from Vogue's Carolyne Cafaro here. The biggest eye-opener for me was that they do not redraft the patterns for "modern bodies", they simply grade them into multi-size patterns and write modern instructions. What would you like to see them bring back? 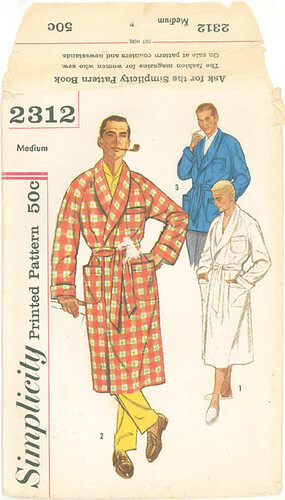 It's Simplicity 2312 from 1957 - note that it comes with a smoking jacket version! Fancy! 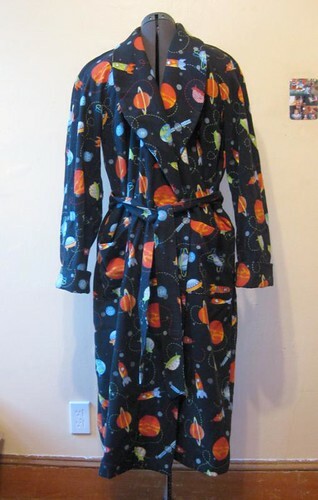 Emily picked out a flannel at Joann's that she liked (a cool outer-space theme) and we got to work. There were a few surprises along the way - for one, I hadn't bothered to actually look at the pattern's instructions or anything (I'm lucky the pieces were all there!) and it was a lot more detailed than I realized. The sleeves are cut in two pieces and fitted at elbow and shoulder, and the belt is permanently fastened on carriers instead of threaded through loops. I didn't think that would hold up, but it's actually much nicer than the usual loop system. In general the pattern was much easier to use and better designed than I expected (or would have gotten from a modern pattern). It's almost scary how easily a truly well-drafted pattern goes together! 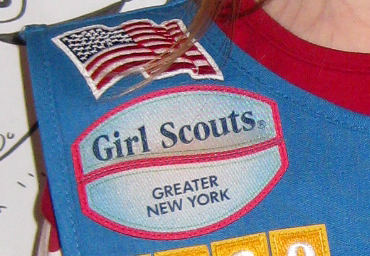 The bad surprise -- the fabric we picked from Joanns was not as nice as we thought -- it was narrower than it was supposed to be and shrank like crazy! I had to go back for more, and lucky for us there was some left. I also ended up interfacing and topstitching it to reinforce the fabric. As it is, I'm not sure how long it'll hold up. But so far it's doing pretty well. And the end result made everyone happy! I really loved making up this pattern, and unless Evan is lying, he loves the robe. Emily loved helping! A win-win all around. And maybe next year....the smoking jacket!